We specialise in real-time content delivery for some the worlds largest brands. “HTTP/2 will solve this” – Everybody If like me, you’ve probably heard a lot of people say something along the lines of “HTTP/2 will solve this” - Myself included. Resource loading in the browser is hard. However, sadly it’s not as simple as that. Hopefully after this talk you’ll have a better understanding of why and what techniques we can use today and in the future to solve this. "A critical request is one that contains an asset that is essential to the content within the users viewport." Whatever we can do get critical resources down to the browser! Now we’ve identified what we should be loading, lets dive into how we can do this efficiently. The first technique we’ll look at is the Preload API. What if we could tell the browser ahead of time what are critical resources are? We identified that fonts are critical resources. However they’re requested late in load. Begins parsing and constructing DOM Discovers CSS/JS Waits for CSS response Constructs CSSOM Combines CSSOM and DOM intro render tree Font requests are dispatched after the render tree indicates which font variants are needed to render the specified text on the page. This is where the preload api comes in. It: "Provides a declarative fetch primitive that initiates an early fetch and separates fetching from resource execution." I.e. it allows the browser to perform the networking without yet discovering the resource during parsing. So this is what it looks like, we now have three new primitives in HTML, JS and HTTP. My preferred method is via the HTTP Link header. Preload JSON as fetch! Modulepreload! Fastly customer Shopify switches to preloading fonts and saw a 50% improvement to time-to-text-paint. 1.2 seconds improvement of a 3G connection. To compliment preload we can also hint to the browser 3rd party hostnames we want to preconnect to ahead of time. Are indicating resource hints via the HTML response too late? This is great! However, are indicating resource hints like this via the HTML response too late? If browser networking were a millennial, the WhatsApp discussion for server push would look something like this. How is this possible? All communication within HTTP/2 is now performed via a single TCP connection with a binary data framing layer. This allows us to send data for multiple requests at the same time, and even data not part of the response, such as a push promise. The most common mechanism the industry has converged on is via the Link header and our preload friend. You must have a HTTP/2 enabled server with push support. Note that we don’t have the no push directive. What does the waterfall look like if we were to use a Link preload header to initiate a push of the main.css file. Note we no longer have idle time on the CSS response as we wait for the content, as the browser never had to send the request. Comparing before and after, we’ve effectively reduced our page load by 1 round trip. Average ~800ms on a 3G connection. This is great if our RTT time has high latency, I.e. on mobile connections in developing countries. Note that we have still idle time whilst we wait for the server to respond with the HTML. Why is this? Let’s look at the request flow again. As server push is indicated via a Link header on the response of our document we have to wait for the server to generate the response before we can push. This leaves a lot of wasted time on the connection, especially if we are using a CDN or proxy service. To recap server push gives us these benefits. Link header as push indicator is too late? 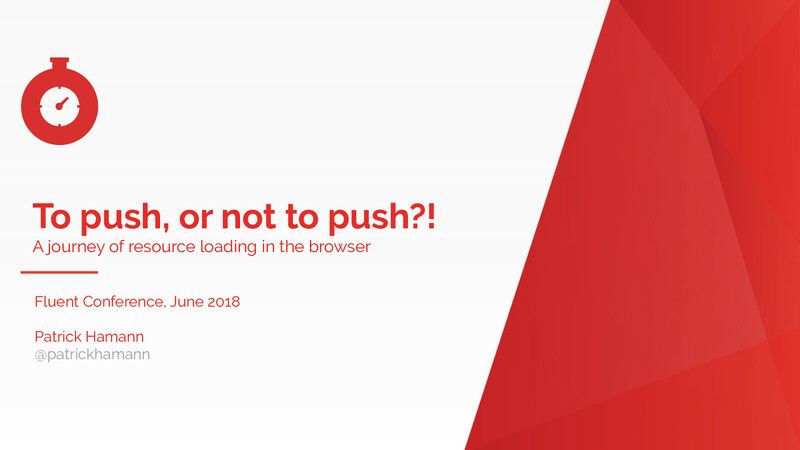 Is indicating push via the HTML response too late? So the question is should we be using server push at all? Is using Link rel=preload as the push indicator in-fact too late in the connection state? How can we achieve the holy grail and push our critical resources during this period. Do do this we need to decouple the push behaviour from the HTML response. This is what at Fastly we’re calling async push. A more common architecture will be for the HTTP server to be decoupled from the application server. Think a reverse proxy etc? nginx/apache/varnish. This allows us to decouple the push logic from the application and initiate a push of the resource as soon as receive a request for the HTML even before we despatch the request to the application server. Achieving our holy grail of pushing during idle think time on the connection. If we have programatic access to the open network connection within our application server we can flush the CSS push before we generate the HTML. Here is an example using Node’s http/2 server to flush the push at the beginning of a request middleware. Note the first thing we do in the response handler is to push the CSS. At Fastly we’ve built this functionality directly into our Varnish proxy layer. Allowing you to programmatically initiate push. So lets look at he network utilisation from our previous push example. Note that we have still idle time whilst we wait for the server to respond with the HTML. So instead of using a Link header on the html response, lets use async push to decouple the initialisation. Note that are now utilising the idle connection time whilst we wait for the server to respond with the HTML. Utilising idle network server think time == win! This is a big win and makes me very happy. Whilst push is useful on the first view, what do you think would happen on a repeat view? So lets look at he network utilisation from our push experiment. If we were to request the same page again what happens? Note we’ve over-pushed the resource, and could potentially create contention on the network or delay our HTML response. Worse than not pushing at all. The server has no knowledge of client cache state. Whilst push is useful on the first view, what do you think would happen on a repeat view? So that’s the theory behind Server Push, it looks like it could be useful, lets’ seem some uses in the wild. The largest user of push in production that I know of is Facebook. They’ve implemented push within their native clients and observed a 15% reduction in time to first byte of their newsfeed images. They discuss their implementation in detail on this @scale talk from 2016. However the interesting thing to note is they only do this on native, not the web, due to cache state issue we discussed previously. Fastly customer Nikkei use push and PRPL pattern for their new progressive web app. Addy and Eva detail the performance metrics behind this in their recent I/O 2018 talk. As HTTP/2 adoption increases, initial findings are showing extremely low adoption of push. I want to do a quick poll now, how many people here are using HTTP/2 in production? How many are using push in production? So if the theory is right, this should be an extremely useful technique for resource loading. But the adoption is extremely low. So whats the problem? After we have sent the push promise frame to the browser it’s common that we’d start flushing the data frames. If the browser already has the resource in it’s cache, it can send a RST_STREAM message to cancel the data. However this is normally too late, by the time the reset reaches the server most of the bytes for the resource have already been flushed to the physical network link, or are in the kernel TCP buffer. The TL;DR the browser inconsistencies of the push cache results in only chrome and Firefox having reliable implementations. Thus leaving us to resort to UA sniffing if we want to use without any gotchas. Lastly the rate of adoption of push is leading to many implementers to abandon the pattern. On Fastly we observe 800 out of 1000000 responses on our network are push initiated. 6 million requests a second. So should you really be pushing at all? Is the 1 RTT saving worth the complexity? Are there other solutions? So if push might not be worth it? What are our other options? The specification is still being actively worked on in draft. However implementations are starting to appear. Fastly’s open-source H20 HTTP/2 server was the first to have a working implementation. This allows the client to initiate early fetches for the critical resources before it has even received the HTML. Much like the benefits of async push but with the simplicity of allowing the client to decide what it needs to fetch. The spec has been accepted by the IETF as RFC 8297 and is currently in experimental. Fastly already has working server implementation. Browser vendors are very interested, but some are concerned about the complexity of implementation. With early hints we get the same benefits of async push, but much simpler. Giving the power back to the browser to make the decisions on what it wants to fetch and appropriately leveraging the browser cache. Now we know how to decorate the HTTP responses with resource hints, using preload and early hints. What if we could also decorate our HTML and sub-resources to change resource priorities. This is where the priority hints api comes in. An extension to preload, priority hints aim to give the author granular control over the priority of each resource loaded by your page. You as the application author know best the priority of your resources. Check out Addy and Eva’s talk from Google I/O this year. If you’re interested, going the discussion on GitHub. So this has been a whirlwind tour of asset loading in the browser. And have only scratched the surface on each methodology but I hope i’ve given you some new techniques to take home and try. Always try to optimise for delightful user experiences and not the network. The future is bright for resource loading! Use priority hints and early hints when available! Please email, tweet or come and say hi to me.